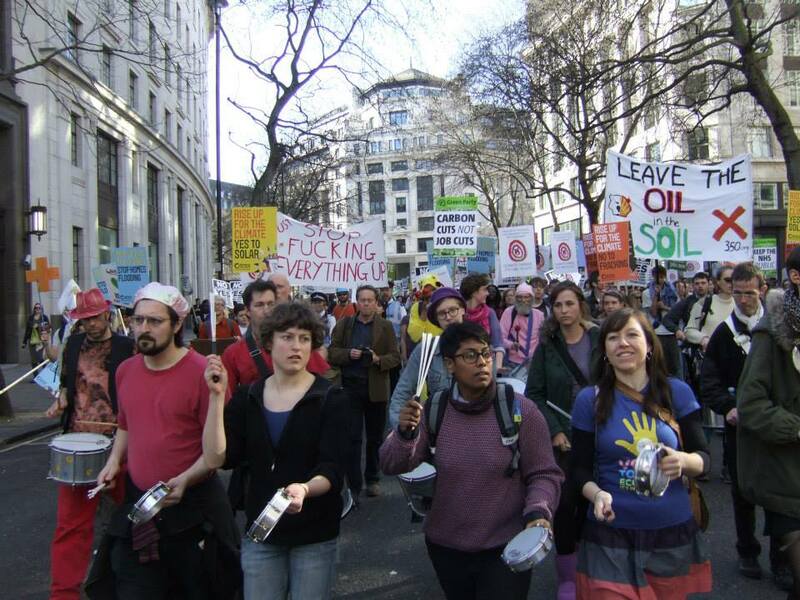 Time to Act climate march – what was missing? 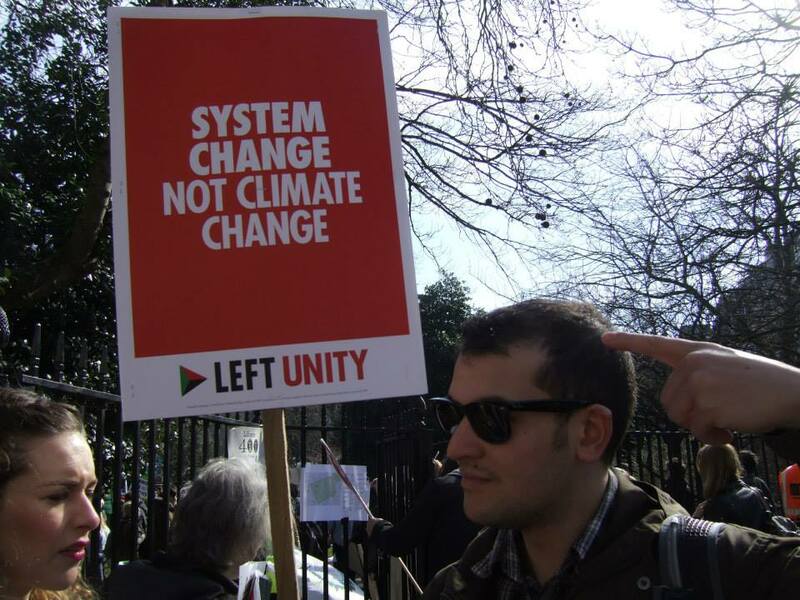 On Saturday, 7th March 2015, I attended the Time to Act climate march. After a winding route through the historic streets of central London, an impromptu sit-down on the Strand, and a spirit-raising day under an early spring sun, we converged on Parliament Square where a number of speakers from charities, trade unions, political parties and other activist groups launched their rallying cries for climate justice, aiming their anger squarely upon the walls of the houses of parliament: the centre of British democracy – those with the power to make change, but who perhaps far too often stand in its way. For me, it was a particularly sobering experience. Not since my first protest attendance at the million-strong “No War on Iraq” protest of February 2003 had I attended a public protest – it’s still feted as probably the largest protest movement in human history – and I was enthusiastic this time, to show up, hold up my placard, and join thousands of concerned citizens to convey our collective anger at what I see to be the complicit and complacent inaction of our government on the urgent challenges of climate and environmental change, in opposition to the rational, fair minded and compassionate citizenry of the United Kingdom. However, after the excitement of the day had worn off, I couldn’t help but feel somewhat deflated by the realities of the movement as it exists today, nearly four decades after global warming was raised as an international concern at the World Climate Conference in Geneva in 1979. A decade too, before I was even born. My main concern was that the attendees, despite coming seemingly from all walks of life, were not justly represented by the big-name speakers in attendance. For sure, there was representation by Greenpeace and Avaaz and many of the usual charitable organisations. There was also representation by a number of trade unions and the equally impassioned orators of environmental-cause NGOs and celebrity activists. But none of the mainstream political parties were present, bar one left-wing Labour MP, John McDonnell. Is climate change an issue undeserving of the legitimacy of our democratic process? There were however a few refreshingly erudite voices in the form of Bangladeshi campaigner Rumana Hashem, comedian, Francesca Martinez, and the blazing writer and activist – via recorded video message – Naomi Klein, author of This Changes Everything. Then there was 12 year-old Laurel, who spoke simply on behalf of her generation. Our climate legacy is to 12 year old Laurel and her generation. The most invisible group, but those very often with the most to say, were the climate scientists themselves. There were no scientists in the list of speakers; no scientific media organisations handing out materials; and no science representative block, as there were for many environmental interest groups. Scientists are absent from the fight. They reliably churn out results, smoothing the climate curves, adding degrees to our predicted future surface temperatures, and adding calamity to the already calamitous ice sheet collapses, and yet we/they stay as staunchly apolitical as ever, perhaps for fear of being discredited as impartial scientists. But to me, it’s the voice that is most obviously missing from the activist debate. Yes, there are scientists on government panels, and in IPCC working groups, but these are only the places that scientists have a duty to be. It is clear however that any paradigm shifting fight, as demonstrated in the previous century, requires grassroots activism. Not accepting the status quo. It was how civil rights were won in the US, how the suffragettes won women’s rights, and how wars became politically toxic worldwide. The point often repeated by the many trade union and intellectual activists is that climate change is not only a non-partisan issue, but an issue which many interest groups would gain leverage if they acted together. For example, the occupy movement, anti-capitalist, and others all have a strong mandate to rid the system of austerity politics, rampant capitalism, and the huge projected industrial emissions that go along with it. Likewise scientists are fighting a lonely battle if they insist on fighting from high up in their ivory towers. For the reasons above, and for the very longevity of our own species, I believe that it has become the job of scientists, not only to carry on doing the science that is imperative to human progress, but also to become activists, reporters and educators on this, the main issue of the 21st century. Thank you for this blog. I, too was on the march last Saturday as well as the one last September. I am struck by the fact that turnout is still low given the enormity of the issue. Engagement is a challenging issue and it definitely needs scientists as well as a wider range of professions, ngos, civic groups etc. As someone who has worked with varied organisations over the years on supporting systems thinking and engagement across professional and occupational divides, it is a skill we need to develop further. From the point of view of a citizen, it is clear that whilst there are specialist educational institutes researching and producing essential work on climate change and planetary boundaries, this is not widely accessible in forms that invite deeper conversations in the wider public. Thank you for your comments! It’s nice to see some engagement on this blog. I agree that this challenging issue would definitely benefit from engagement from a wide range of groups. My own observation is that scientists are busy science-ing, and are reluctant to leave their comfort zone. However, I do think they have a bigger role to play in communicating their work effectively in a way that is accessible to the wider public, who undoubtedly have an interest in what they do. I’m a big fan of MOOCS. I think you’re right. For complex issues like climate change, these types of online learning facilities do create communities of up-skilled and engaged people on divisive topics. I wasn’t on the march. I am one of the thousands of people active on climate who find marches basically soul-destroying and counter-productive. Thank you for your response, and your website links, which I’ve read with interest. I don’t happen to think a march can hurt a social movement, and often times, as in the last march in New York, some very influential politicians, celebs, etc. turn up to make it a powerful demonstration of the mission of the movement. No, a march cannot make a difference when 10,000 people turn up, but maybe when 100,000 do. The social movement come first, for sure. And I agree, Kevin Anderson is the embodiment of the scientific and activist movement. I was one of the organisers of the Time to Act March. Firstly thanks very much for writing your blog on the March. Thanks for your feedback about areas that needed to be represented on the speakers platform. We did invite Kevin Anderson but unfortunately he was en route back to the UK on the day of the March and was not able to speak. I agree the input of climate scientists in the growing movement is very important. There was briefly a discussion amongst some of the activists helping to organise the demo who were from a science background about organising a scientists and medics bloc on the demo. Unfortunately that doesn’t seem to have come off, but there is clearly a need and an interest amongst many from the science community to get organised in this way. It’s great to hear from one of the organisers. I hadn’t anticipated my blog reaching such a broad audience. I can of course appreciate the hard work that goes into organising such an event and it’s unfortunate that scientists like Kevin Anderson could not make it in the end. I would be happy to be involved in a collaboration of scientists turned activists. You can find my contact details through this website.